I absolutely love this time of year. The air turns crisp and cool, leaves start to change their color, and just about every shop in town releases a plethora of pumpkin products that you positively need. Fall is probably my favorite season, and while some may start dreading the Christmas countdown, I embrace this time of year and take full advantage to bake my little heart out! There is nothing like saying farewell to summer than with a plate full of goodies. 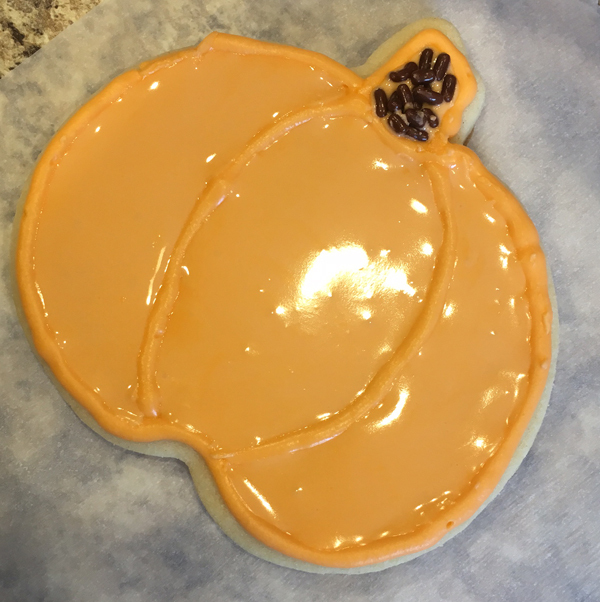 So, I’m hoping to spread a little of that Fall-time enthusiasm with some baking tips! 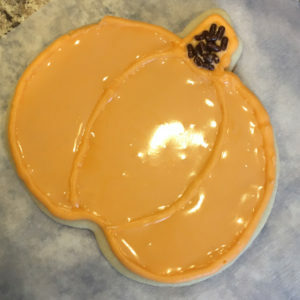 Follow along as I show you how to decorate some adorable pumpkin shaped cookies with royal icing. I keep my cookie baking simple and fast. While I do love to bake some things from scratch, time isn’t always on my side to do that. So, I opt for a trip to Wal-Mart and grab a box of their Great Value Sugar Cookie Mix. Note: It’s important, if you are using cookie cutters, to use box mix and not the refrigerated dough. The box mix will actually maintain its shape, where the refrigerated dough will puff up beyond all recognition. Follow the instructions on the box to make your dough. I always add a little extra flour, and roll the dough onto wax paper covered in a thin layer of flour to help keep the dough from sticking. I also use parchment paper on the cookie sheet to help keep the cookies from sticking or burning. Once the cookies are baked, allow them to cool. You cannot decorate a hot cookie! After the cookies are completely cooled, then you can start to make your royal icing. The key to royal icing is precise measuring, and slowly adding the water. Beat the icing together until it forms peaks. This is meant to be a stiff consistency so that it holds shape and does not run. Note: If you are going to color the icing and use multiple colors, divide this icing now into smaller bowls. Use a damp paper towel or plastic wrap to cover any unused icing so that it does not set up in the bowl. Since these are pumpkins, I kept it simple and just mixed up some orange colored icing. I used a 10 oz decorator bag, and tip #5. You may choose to use a smaller tip, depending on how fancy you want to get with your cookies. 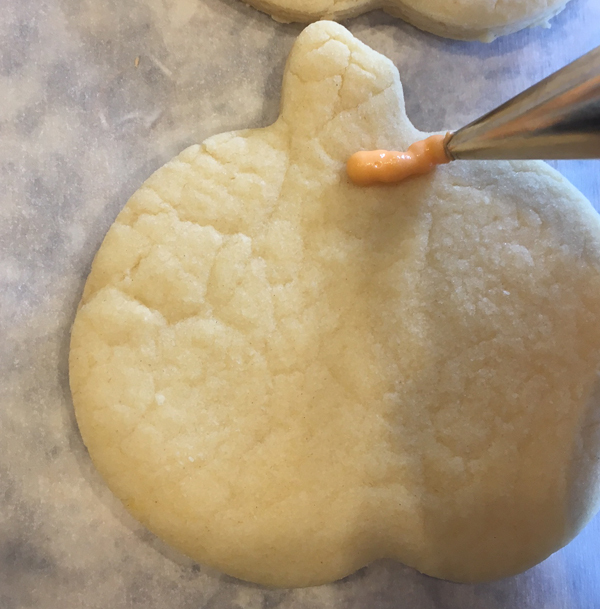 Step 1: Outline the Cookie. Float the tip over the cookie, and try to maintain a consistent flow of icing as you work around the cookie. Don’t forget to outline the stem! Add some detail. I chose to add some slightly curved lines, but you may choose to add swirls or polka dots! Continue to outline all your cookies. Don’t worry about any peaks or bumps, you can smooth those out with your finger or a toothpick! Step Two: Fill the Cookie. 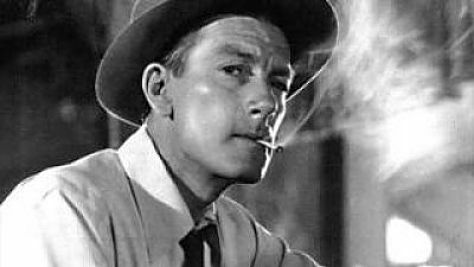 You want to be sure that you are completely done with any outline work before you start filling. 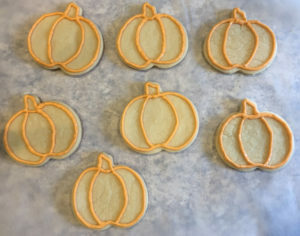 You will need a thinner consistency of royal icing, which is very simple to achieve. To thin, add a teaspoon of water at a time. A good rule of thumb is 1 tsp of water per cup of icing. Flood an outlined area with the icing. Use a toothpick to spread the icing out to the edges or to any tight spots. Step 3 (optional): Add Sprinkles. I added chocolate sprinkles to the stem. But, you may choose to add sprinkles or some other decorative touch to your cookies. The icing will set smooth and glossy. 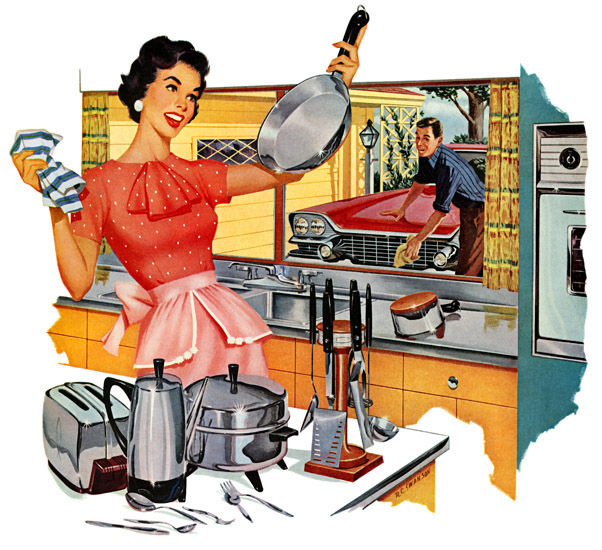 You can speed up the process by setting them in the refrigerator — just remember to keep them flat! 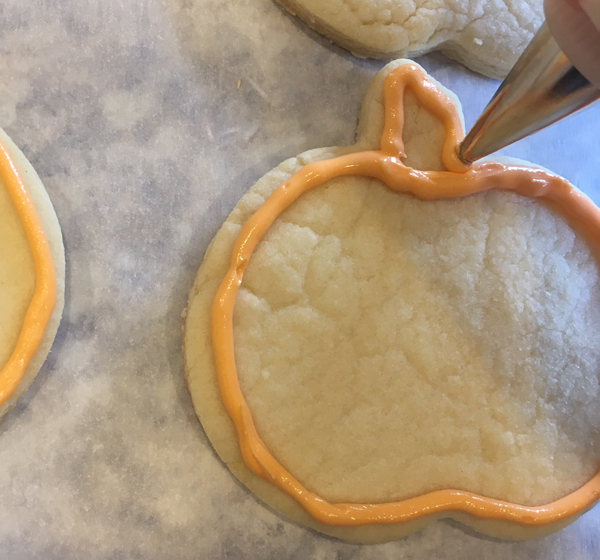 As simple as they are to create, you are sure to have some impressive cookies this season! 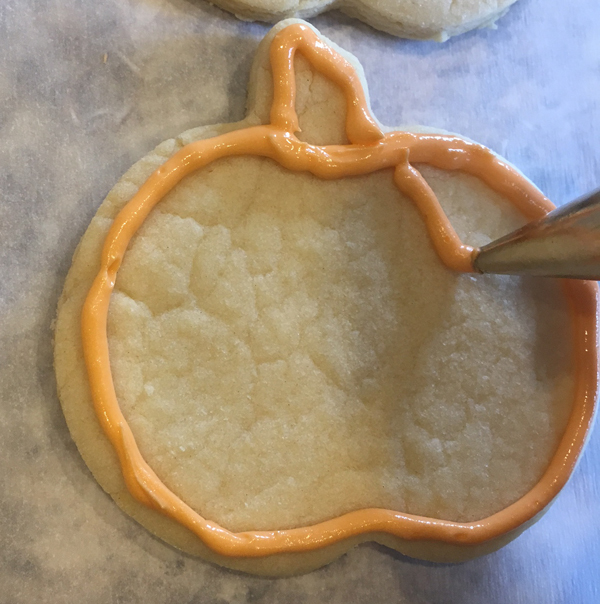 I am no pro, not even close, but decorating cookies with royal icing has quickly become my go-to for parties and gatherings. So, I encourage all of you out there to give it a try! 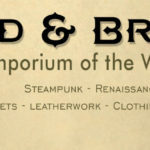 I would love for you to share your ideas and creations with me! Stay tuned for more baking ideas!